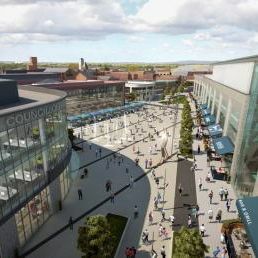 Muse Developments is scheduled start work on a £52M mixed use regeneration project in Warrington, Cheshire, early this year after the scheme was granted planning approval. The developer is delivering this ‘Bridge Street Quarter’ scheme alongside Warrington Borough Council and the town’s urban regeneration partnership Warrington & Co.
Once completed in 2019, the project will provide 25,000 sq ft of retail space, 60,000 sq ft of leisure space (including cinema and restaurants), a 30,000 sq ft indoor market hall and a 65,000 sq ft Council office building. A refurbished 400 space multi-storey car park will also be provided as well as a new public square. The new market hall will incorporate a Grade 2 listed former Boots building façade on Bridge Street as one of its entrances. The scheme will be delivered in two phases in order to minimise disruption for market traders and allow the market to remain open throughout construction. The project represents the first part of the Council’s 25-year strategic masterplan for the town centre and waterfront area, which is one of the largest regeneration schemes in the region.